After walking through the preparation and site set-up in Part 1, and two location set-ups in Part 2, we round off the series with a more complex set-up for flash photography at location 3. Location 3 is at the side of the barn, in deep shadow – with a lovely perspective up the side of the building, and a rustic looking ‘Dutch-Barn’ style door to add character. Unlike the flash set-up in Location 1, where we went for balanced lighting, at location 3 we’re going to employ a more advanced technique known as ‘black canvas’. Black Canvas uses flash illumination to completely overpower the available ambient lighting, allowing for a more dramatic ‘theatrical’ look, and complete control of any ambient lighting that you do want to introduce into the final image. To accomplish this, we meter the ambient lighting using the X-T1, and then set up the flash to deliver light at 1-2 stops brighter than ambient. We then set the camera to shoot at this aperture, and 1/180 sync speed. So without the flash firing, the scene would look dark/black, as the ambient light would have little effect. The flash becomes the key source of illumination, and by adjusting shutter speed down from 1/180, we can choose to allow more ambient light into the image in-camera, and/or we can bring up the shadows in post processing to add back in some ambient lighting to the final image. This gives yo a huge degree of creative control – you’re effectively bringing your own ‘Sun’ to the shoot, and painting the light with it as you see fit. On day 1, we use a single head, with the 60″ silver brolly, to provide illumination of the subject from high center left. This provides a mini sun for our model, giving a natural top-down look to the illumination. The shadow all but vanishes behind the model using this angle, giving a nice clean fashion look to the image. Shadows under the chin etc, are well concealed, and the over-all effect is very even and smooth lighting. 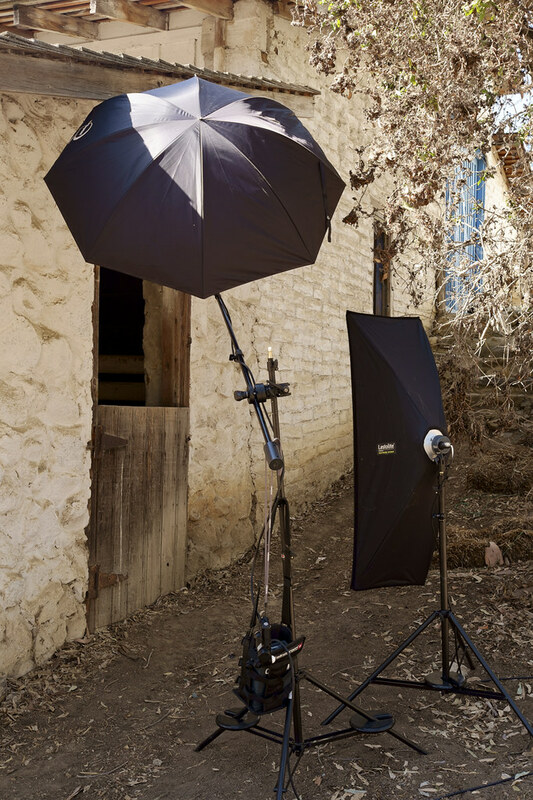 Moving to day 2, with the second model, we add in the long strip soft box to fill the body with soft diffused light, and push the brolly up higher on a boom arm, top-left, as the key light. It’s not immediately obvious that it’s a ‘flash’ photograph, which is the whole idea – and with a little adjustment, there’s enough ambient light to flesh-out the texture in the wall behind the model. Moving in for 3/4 or head shots, the lighting is very flattering to the subject, although you can now see the tell-tale twin catchlights as before. The black canvas technique really comes into play when you have flash heads powerful enough to overpower ambient – so the Elinchrom Quadra is ideal, as you get 400 Watt/Seconds of output. Enough to overpower sunlight in many situations. Damien Lovegrove uses the same techniques (and flash heads) for a lot of his work. Many thanks to my fabulous models, Morgan and Brittney, who were both superb, and handled the rough terrain of the ranch, in heels, with style! Hopefully this series has answered many questions for people around photoshoots, workflow, lighting etc – and if anyone has any additional questions, please don’t hesitate to post or email.